A weekly vacation rental located in a peaceful picturesque neighbourhood on the edge of the old town of Niagara-on-the-Lake, close to Mississauga beach and Ryerson Park, this quaint turn of the century three bedroom gothic cottage farmhouse with original pine floors is furnished with antiques and has a sunny enclosed private garden with a heated pool surrounded by perennials, trellises and 100 year old trees. Away from the downtown crowds, it is just minutes from the Niagara-on-the-Lake golf course, main street shopping, Niagara wineries, historic Fort George, Fort Mississauga, the Royal George Theatre and the Shaw Festival Theatre. Meticulously restored and maintained, it has a delightful charm that will make you feel instantly at home. Stroll down to the beach in this relaxing neighborhood and watch the evening sun set over the lake. 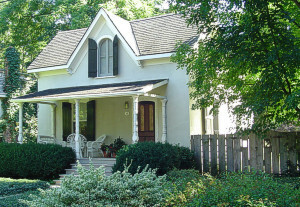 Take a walk around the lanes and see the remaining Chautauqua cottages built late in the 19th century when the area was a summer resort. Go for a bike ride through the vineyards then relax by the pool as you sip one of Niagara's fine local wines. Winter (November - March): $1706/wk. For information on stays shorter than one week please contact the property manager. Shorter stays are calculated based on the daily rates. There is a $150 surcharge on stays less than 5 nights. 13% HST not incl. This is a pet-free and smoke-free environment. Please contact the property manager at braelyn124@yahoo.com.